From undergraduate classes to graduate seminars, spring courses offer students multiple opportunities to engage deeply with topics that impact their own lives and the lives of people around the world. A course on birth juxtaposes the universal experience of giving birth with specific cultural settings across the globe. A research methods course highlights the importance of water, sanitation and hygiene issues locally and globally. Then there is a course featuring a “Shark Tank” exercise for students to present social enterprise projects to improve an aspect of global health. Some courses tie social media and contemporary communications methods to specific disciplines, while others examine topics from ancient DNA to the evolution of childhood and modern understandings of hunger. View-broadening courses explore the topic of “place” in France and, of heightened relevance currently, the rich realities of the two Koreas. There are also courses on archives, art, anesthesiology, African-American literature and oral history. And these are all just a sample of what’s on offer. Course description: Picasso said, “Learn the rules like a pro so you can break them like an artist.” This legal blogging class isn’t exactly artistry, but it is a place where students can violate the traditional conventions of legal writing. Photos and other visuals? Check. Links instead of formal legal citations? Check. Intentionally incomplete sentences for rhetorical impact? Check. In the capstone project of the class, students stretch their writing skills by selecting a niche and an audience, like explaining drone law to non-lawyers. Each student designs a WordPress blog for their chosen niche, with a series of legal-analysis posts. Course description: This course examines the relatively new field of ancient DNA as a transformative way to understand evolution in humans and other species. By accessing the genetic material of a population from known archaeological contexts, students are able to study evolution in both space and time. Cool factor: Students in this first-time course will learn about human migration, plant and animal domestication, ancient pathogens and the origins of autoimmune disorders — all by focusing on the key methods adopted in the study of ancient DNA, such as next generation sequencing and population genetics, as well as a thematic approach to the major evolutionary questions of the day. Course description: In this three-semester course that spans the first year of the AA Program, students have the opportunity to practice scenarios that they will encounter in the operating room utilizing a high-fidelity patient simulator in a safe environment. Students interact with a blinking, breathing robotic patient and experience the changes in physiology and impact of drug administration that may occur during an anesthetic. The simulation faculty reproduce a given scenario as realistically as possible and debrief one-on-one with students after each session to give immediate feedback on the student’s performance and comfort-level managing the scenario. Cool factor: Think of human patient simulation lab for student anesthesiologist assistants like flight simulation for pilots. The technology in the mock operating room and the expertise of the AA Program’s simulation faculty allow for student anesthesiologist assistants to practice their skills, develop their professional demeanor and gain confidence. They get hands-on, individual teaching time and immediate feedback about their progress. Course description: Why does archaeology inspire endless theories about aliens, lost civilizations, apocalyptic predictions and mysterious technologies? While archaeological investigation is in many ways about solving ancient mysteries, archaeology is grounded in rigorous methodologies, careful accumulation and analysis of data, and scientific method. But that doesn’t mean those skills can’t be learned by looking at larger questions about uses of history and the evolution of political and religious ideologies that are built on historical and archaeological ideas. Cool factor: Students will study where pseudo-archaeology comes from and the cultural work it does and learn the foundations of archaeological methods and scientific inquiries by studying the story of Indiana Jones (he was onto something about Nazis and fascists abusing archaeology), the lost island of Atlantis and breaking down evidence about who really built Egypt’s Great Pyramids. Course description: Birth is a universal event, but how it is experienced by women varies across cultures. The purpose of this interdisciplinary course is to examine birth in the context of global health. Themes of joy, fear and pain in childbirth, as well as meanings of pregnancy will be explored in different times and places. Urgent issues in global reproductive health will be analyzed, such as reproductive rights, equity, access, and quality of health care during birth. Additionally, there will be a focus upon the care that nurses and midwives contribute as they attend birth, both in previous and contemporary times. Cool factor: The course features debates about best place to give birth, a visit to the Atlanta Birth Center, a variety of ethnographies read by students and presented using the Pecha Kucha presentation format, films about birth providers and birth around the globe, and interdisciplinary discussions. Course description: Covering the biological foundations of social and emotional development, this course discusses life history from fetal life through puberty and parenthood, comparative child care, early experience effects, stress responses, hunter-gatherer childhood, cross-cultural comparisons of childhood and child rearing, theories of culture and personality, and human universals common to all human brains and minds. How did parent-offspring conflict figure in human evolution? What are our legacies from animal and ancient human development? Is “maternal sentiment” universal? Is culture unique to humans? How do genetic and cultural evolution interact? And, what are the unique features of human childhood? Cool factor: The course is based mainly on student presentations with the purpose of fulfilling the goal of the Center for Mind, Brain and Culture’s multidisciplinarity. The aim of this course will also be a truly multifaceted understanding of human childhood. Participants include biological and cultural anthropologists from the Laney Graduate School, a student from the Rollins School of Public Health and an auditor from the Classics Department faculty with an interest in children of the ancient world. Course description: A colloquium that examines the history of hunger as a modern concept, tracking its changing meanings through the past 200 years. It also examines the history of hunger as lived experience, attending to both acute episodes such as famines and chronic hunger, while exploring modern agricultural development and the Green Revolution. Cool factor: Students will learn how hunger emerged from a fact of life to a social problem that has drawn attention as recently as the food price spikes of the 2000s. Students also will survey the ways that hunger has been represented globally, to understand not just food scarcity but also production, distribution and access as hunger evolved as a concern. Course description: The course explores the historical production of paper as well as a material from which to make art. Students are not only introduced to the social, historical and religious contexts of paper and the purposes to which it was put, but they will create paper and ornamentation in those styles. Students will learn to process and blend raw fibers such as cotton and Manila hemp into high-quality paper, design watermarks, learn to dye fiber, create 3-D paper sculpture, develop their own illuminated capital and complete a final portfolio utilizing their own paper as the medium. Cool factor: The course challenges the notion of single-use, disposable paper. As students learn the difficult art and craft of hand papermaking, they have to consider the resources (material and physical) that are required. Students respond to seasonality when sourcing natural dye materials from the Oxford College campus and the Oxford Organic Farm, producing beautiful and variable colored papers. With a strong focus on reuse, our studio re-purposes water, fiber, dye materials and found objects to form new artwork. 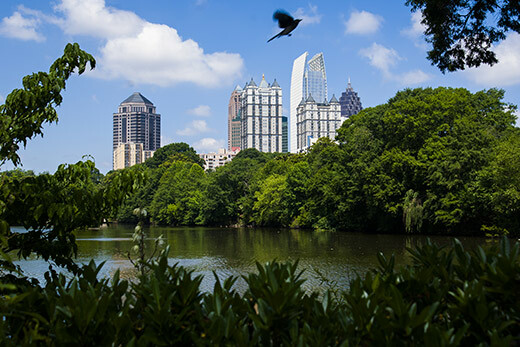 Course description: Atlanta was the site of the first “slum clearance” project in the United States, in 1934, and America's first completed — though segregated — federally-funded public housing: Techwood and University Homes. Using these projects for research, students will gain facility working in Atlanta-area archives through theoretical and historical readings and discussions and hands-on work and workshops with archival specialists. This seminar seeks to plot Atlanta on the interwar architectural map, establishing the city’s role as a clearinghouse for European social housing ideas in the U.S., and as the earliest homegrown precedent for the Roosevelt administration’s New Deal public housing. Cool factor: Each student will select a different Atlanta archive as his/her research site for the semester. Course partners include the Atlanta History Center, Atlanta Housing Authority, Atlanta University Center, Georgia State University, Georgia Tech and Emory’s Stuart A. Rose Manuscript, Archives and Rare Book Library. Student research and writing will be featured in the new digital humanities project, Atlanta Housing Interplay, being developed by the professor in collaboration with the Emory Center for Digital Scholarship. Course description: Offered to students for only the second time, this course enables participants to develop the valuable skills to create useful oral history projects that include active listening, crafting an engaging interview that uses open-ended questions, studying the ethics of engaging with living sources, and learning the techniques to produce useful oral history transcripts. Each student will select a subject of interest and create an oral history interview worthy of inclusion in Oxford's Oral History Project archived in the college's library. Cool factor: Guest speakers who use oral history techniques in their research and scholarship will visit during the semester, and the class will tour the Atlanta History Center to view the "Atlanta Voices" exhibit that is based on oral history interviews of Atlanta's diverse population. Course description: This course explores the themes, functions and portrayals of racial passing and miscegenation in 20th century black American literature from notable authors such as James Weldon Johnson, Nella Larsen, Michelle Cliff and Natasha Trethewey. Cool factor: Students will debate and analyze questions of identity, literary tradition and the ways in which passing and “race mixing” destabilized the construction of segregation and American history. Course description: If sport really is "just a game," why does it seem to matter so much to people the world over? Do sports and politics ever mix? Is it unjust that women athletes earn less than men? Sports may be games, but the ethical questions they raise are serious. This course will focus on the ethics and metaphysics of sport, and on sport as a social practice including both athletes and spectators. Students will learn to apply philosophical tools of analysis to sport, and to think about the ways in which sports practices might help to illuminate standard philosophical problems. Cool factor: Students will contemplate the mind-body relation while hitting balls at a driving range, and will consider the connections between sports and nationalism at a Winter Olympics viewing party. They will also discuss the racial politics of American football with a former NFL player, who will be a special guest lecturer. Course description: This hands-on course explores the fast-growing world of podcasting and teaches students the research, writing and technical skills to produce lively and effective podcasts on health topics and issues. Cool factor: Each student will select a semester topic and create audio and video podcasts on subjects related to the topic. The class will publish the work on individual student websites and other platforms at the term’s end. Course description: This hands-on course covers methods needed to carry out field studies focused on water and health. Through lecture and laboratory exercises, students learn critical skills in measuring water quality exposure assessment and waterborne disease health outcomes that will enable them to conduct their own field studies and analyze the resulting data. The focus is on issues of microbiological contamination in developing countries, but chemical contamination and domestic cases are also covered. The course teaches water quality testing, survey design, data collection on mobile devices, structured observations and in-depth interviews. Cool factor: Students learn field and lab methods for studying issues of water and health, then apply those newfound skills to their own research project focused on water, sanitation and hygiene issues in metro Atlanta. Past group projects have focused on topics like hygiene practices in Atlanta dog parks, water quality in the Chattahoochee River and water quality in Emory students’ water bottles. This year’s project will relate to human interactions with water in Piedmont Park. Course description: Places are filled with the sights, sounds and smells of the contemporary moment, the breaths of inhabitants and, as Patrick Modiano put it in his 2015 Nobel Lecture, “the writings and overwritings of a palimpsest.” In this course, students will explore how writers like André Breton, Aragon, Patrick Modiano or J.M.G. Le Clézio are particularly attentive to the multiple layers of places, and then they will explore the places themselves in a trip to Paris and the Mediterranean coast. Cool factor: The course culminates in an eight-day trip to Nice and Paris where students experience some of the places they have read about in their novels. For example, students will visit Saint-Martin-Vésubie and hear for themselves the water trickling through the streets that so charmed Esther in Le Clézio’s Etoile errante, and they will contemplate why the “very beautiful and very useless” Porte Saint-Denis in Paris fascinated André Breton. Course description: The two Koreas have always been portrayed in contrasts: one as an open, vibrant capitalist democracy thriving in the world stage; the other as a reclusive society sustained by an anachronistic system of dynastic personal rule. While this may not be incorrect, this kind of dichotomous framework often blinds us to the common denominators that underlie both Koreas. This course challenges students to look beyond this simple binary and gain access to the richer realities of a divided Korea, its shared historical roots, and new insights concerning the ongoing debates pertaining to the Korean problem. Cool factor: In this course, students can learn about what’s up with North Korea, the historical and international contexts that gave rise to the current tension, and how to make sense of the war of words between Donald Trump and Kim Jung Un.